Nuttall, V.W.. "Pepper". The Canadian Encyclopedia, 04 March 2015, Historica Canada. https://www.thecanadianencyclopedia.ca/en/article/pepper. Accessed 24 April 2019.
Pepper (Capsicum annuum) is a perennial plant, cultivated as an annual and belonging to the nightshade family. Red Bell peppers. Pepper cultivars produce fruits that are most often red, yellow or orange. The fruit is also consumed when it is unripe and green (courtesy Isis Gagnon-Grenier). Pepper (Capsicum annuum) is a perennial plant, cultivated as an annual and belonging to the nightshade family. Native to tropical America, peppers were widely disseminated after Columbus's discovery of America; some botanists now claim that certain species are native to southern Asia. Some botanical varieties crossbreed naturally and many cultivars (commercial varieties) exist. Most pepper plants are well branched, 35-80 cm tall, with smooth, glossy, oblong-to-ovate leaves. They bear either erect or drooping fruits. Immature fruits of all types are green. Depending on variety, mature fruits are mostly red or yellow, and sweet or hot. Most fruits are puffy regardless of shape; all types have a central core with attached seeds. Peppers are started under glass, 8-10 weeks before transplanting, after all risk of frost is past. They require 55-80 days to mature in the field. Across Canada, common insect pests are potato aphids, flea beetles; in southwestern Ontario, European corn borer, pepper maggot and green peach aphid. Major plant diseases are damping-off, bacterial leaf spot, viruses and Verticillium wilt. 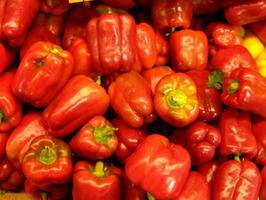 Peppers, high in vitamins A and C, are eaten fresh or cooked, or used to produce condiments, pickles, sauces, etc. Varieties have been developed for Canada's different climatic regions. Ontario accounts for over 65% of Canadian production, and Québec for nearly 30%.